Today there are smart phones such as the Samsung Galaxy S4 that can shoot 4K video. There’s already a sub $1000 4K TV set (although most 4K TVs are $5000 – $6000.) Even YouTube now accepts 4K video. 4K is also called “Ultra HD. It carries four times the data and is four times the size screen of HD. To keep the 16×9 format we are all so used to, 4K is actually 3840 x 2160 pixels, but the resulting images are so much sharper with richer, deeper colors. Despite the clear advantage of acquiring in 4K, few productions are actually shooting 4K. For most, 4:2:2 or 4:4:4 HD codecs have been good enough for feature films and dramas. Some of the 4K which is being shot now includes episodic TV or web series, sporting events and commercials. The footage is typically down-converted to HD resolutions for TV and the web. But the digital masters are output and stored at much higher resolutions. This strategy future proofs the content so it may be viewed at 4K resolutions as the market changes. 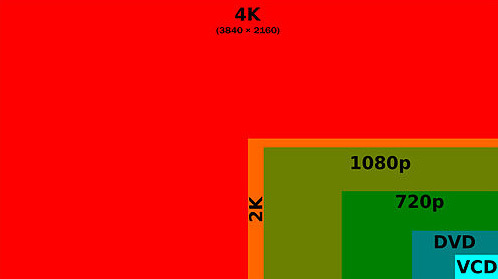 Hollywood will probably be the industry that determines when 4K will become the new standard. For video production companies, the switch to 4K will not be cheap. Not only will we have to invest in 4K cameras, but we’ll need new computers, monitors, and storage devices that can handle the massive amounts of data. The flexibility in post is stunning. You can easily crop, zoom, and manipulate content in post. Shooting green screen will make your keying process much simpler. With four times the data, your keying software should have an easier time differentiating the green pixels you want to key from the precise edge of the talent. But it also makes mismatches between background and subject more obvious. Motion tracking with so much more detail is much easier than in HD. Since there is so much more detail, you’ll have to adjust your eye so the detail that might get lost in HD shooting is now visible. In fact 4K is so saturated with detail that a deep-focus shot can become overwhelming in the amount of detail that is visible. Another advantage is the ability to pull high-quality stills from your footage. Some still photographers even shoot 4K video primarily for the goal of creating still images. Lighting may need to be bright enough for faster shutter speeds so the photographer can freeze motion in each frame. If you can shoot in 4K now and down convert for distribution, you are future-proofing your work and equipment investment. This gives you and your clients the ability to manipulate the footage for future use. But there’s a catch, actually several of them. The 4K files will be gi-normous. For instance if you’re editing in Final Cut Pro and have to trans-code some outside footage to ProRes, you will be dealing with very large files. One approach to the storage problem is to plan on shooting in 4k selectively, and sticking to 1080p for most of your distribution. However, considering how the cost of storage continues to decrease, this may not be the worst problem. Many high -end cameras require external recorders to capture uncompressed 4K RAW files. The RED, Sony and Canon 4K cameras are all equipped with SDI ports for connecting external recorders. The external recorder will also “de-Bayer” the image which helps in post-production. “De-Bayer” is the process of building a full-resolution image from a “Bayer” sensor-originated file. A Bayer filter mosaic is a color filter array (CFA) for arranging RGB color filters on a square grid of photosensors. With so many more pixels, the quality of lenses is much more important. So Zeiss and Cooke lenses tend to be used. In addition to a new camera, computer, monitors and storage, you may need new software like Photoshop, After Effects, and possibly the editing program. Transitioning to 4K production is clearly not to be taken lightly. An HD home projector with a 6 foot screen looks great. Will 4K footage look much better? How far away is 8K? The Sony F65 can shoot 8K now. The Sony F65 4K is the Big Cahuna of the 4K cameras. It can shoot up to 8K. And competes directly with the RED cameras. The F65 is about $120,000 without lens. I edit 4K RED with FCP X, grade in Resolve, and I don’t have any issues.